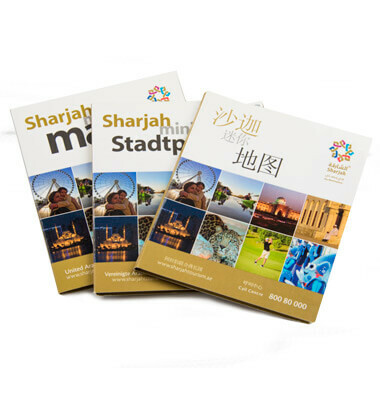 The award-winning team produced English and Russian Mini Maps of Sharjah. Our expert cartographers and in-house professional created an accurate and sophisticated map covering the emirate’s complex road network, area names, significant buildings, key attractions and new developments. Using satellite imagery and definitive icons and eye-catching keys, we pinpointed Sharjah’s hospitals, parks, hotels and much more. Explorer also created and sized the map to meet the Sharjah Commerce & Tourism Development Authority’s exact specifications, simultaneously promoting their excellent focus on what makes Sharjah so special.